I got a lot of cool gifts for Christmas this year, here are some of them. I think I've got a lot of great reading ahead of me. 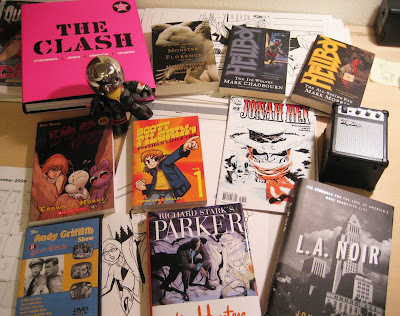 Really looking forward to Darwyn Cooke's Parker book, wrapping up Bone and starting Scott Pilgrim. Also The Clash book looks most excellent. And Hellboy books are always good. Hope everyone had a great Holiday and has a great new year. Thanks to everyone and anyone who stopped by here in 2009. I hope to see you back again in 2010 and I hope that I can keep it interesting here. What's the little amp? Is it a pencil sharpener or something? Nifty. It's a mini iPod speaker. Plug your iPod in and crank that sucker.